Home / News / London Marathon – They Did It! 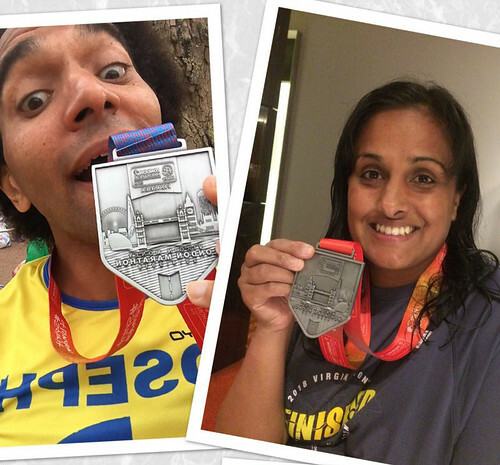 London Marathon – They Did It! Huge congratulations to Joseph Coelho and Manjeet Mann who both completed the London Marathon on such a swelteringly hot day! We are so proud of them and all their hard work to support Half Moon. There’s still time to sponsor them! Joseph said: “Such a honour to take part and to raise money for the wonderful Half Moon Theatre. It was hard going and my final time was 05:36:4, which was not a personal best – but given the heat and the gap in training due to illness I’ll take that! There is something about the endeavour that brings out the best in people. I saw people carrying others and countless people running for loved ones, it really is an emotional and physical rollercoaster and a lesson in perseverance. Hover over the image below to view the gallery’s navigation.